Camping without coffee is simply boring. Do you agree? Drinking coffee is a daily ritual for the many of us. But what if we love both camping and coffee? Fret not! There is a solution to that because you can use a camping pot. Let’s find out how to use a camping coffee pot in the following. Fill the pot: The first thing you need to do is to fill your pot with the number of cups you intend to boil on it. However, do not attempt to fill it with too much water. Otherwise, you might have to deal with the mess later. Most of the camping coffee makers have their fill line, anyway. You just shouldn’t go beyond that line. It is the guide as to until where you should fill your pot. Add coffee: After filling the pot, you should add your coffee. If regular ground coffee is what you’re using, you should buy filters suitable for your basket. On the other hand, you might not need it if you’re not going ground but fresh coarsely ground coffee. It is for the same reason you should check the percolator to determine what will suit your needs. Wait for it to boil: Put the pot on your camping stove or grate over a fire. Then, you should watch the coffee pot to boil, but it will take a little while before it will boil if you’re using camping fire. On the other hand, you should put the flame only at medium strength if using a camping stove. Unlike with drip coffee makers that you can walk away from, you should not leave the camping coffee pot and watch it boil. The water will begin percolating to the top of the pot where you’ll see bubble spot. You should then adjust the flame when it starts to happen. Continue the process for up to 15 minutes. While boiling the bubble spot of the water will keep darkening. Pour and enjoy: And finally, you will have your aromatic and warm cup of coffee that you can enjoy alone or with friends or loved ones. 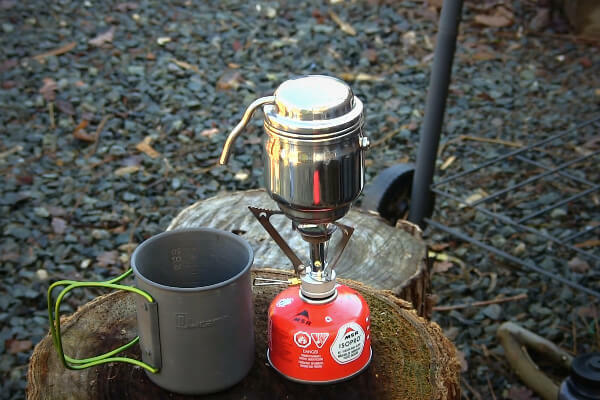 Aside from knowing how to prepare your hot cup of coffee for amazing mountain mornings, you should also know the different camping pot styles that you can use for making coffee. Vintage camping coffee pot: A vintage camping coffee pot is commonly used for brewing coffee. It is a favorite among coffee lovers who also happen to enjoy camping or doing outdoor activities. Old camping coffee pot: An old camping coffee pot may be old, but it is still used in many camping sites and by many families today. They are ideal for use in camping or hiking because they’re made of durable materials that can be placed over campfire or a grill. Another thing to know about coffee pots is the material from which they are made. But as they are specifically made for camping and outdoor fire, they are made of hard and heavy-duty materials that can be exposed over really hot fire. Aluminum camping coffee pot: They are the less expensive coffee pots that you can opt for if you don’t have the budget to spend for a higher cost product like stainless coffee pot. It also heats evenly and quickly. The problem is that it can be prone to warping. Camping coffee pot enamel: This is a beautiful coffee pot that is easy to clean and store. It is also durable for use in camping sites, on an open grill or campfire. It can distribute and retain heat well, too, so it is chosen by coffee lovers looking for a reliable coffee pot. Blue enamel camping coffee pot: It is one of the most traditional camping coffee pots on the market and is also elegant-looking. You can opt for it if you’re looking for a durable and quality camping coffee pot that will help you with warm mountain mornings. Stainless steel coffee pot for camping: They are the more expensive coffee pot for camping, but they are reliable because they do not rust or corrode. You can choose them if you don’t mind the price but the quality of the camping coffee maker. It is also nonreactive, conductive and durable. It also has good heating ability. The types of coffee pots also vary aside from the varying materials used. In the following, let us talk about the different coffee pot types to find on the market. Check them out and be able to compare each of them to determine what the right one for you is. Camping percolator coffee pot: The percolator coffee pot works by brewing the coffee but with the continuous cycling of the boiling or by nearly boiling brew through the coffee grounds with the gravity so that the required strength can be achieved. The percolator coffee pot is one of the most traditionally used in the camping world. Propane camping coffee pot: The propane coffee pot is an ideal outdoor gear. It is a lightweight and portable coffee pot that works like a kitchen machine that makes use of water, coffee grounds and a filter along with a propane tank. The coffee maker is cordless, too, making it a portable choice among outdoor adventure lovers not wanting to miss their cup of coffee back home. Camping Coffee Pot Press French: It is a simple machine that is made of stainless steel with a handle, a steel cover that has a movable plunger and a mesh stainless steel near its top. However, people who are unaware with the product might be confused and think it is a creamer or a teapot. Portable coffee pot for camping: As the word “portable” says, this coffee pot for camping is very easy to transport and carry anywhere. It is lightweight and durable, too. Highly portable models can brew your favorite coffee so that you can enjoy your favorite coffee without any hassle. It is also easy to clean and convenient for multiple uses on a single trip. Electric coffee pot for camping: This coffee pot for camping requires electricity to run. With it, you can always have your favorite cup of coffee on the go. You can easily plug and switch it on in your recreational vehicle and brew a cup after cup. There are many camping coffee pot colors to choose from, each with a striking shade that matches your preferences and style. In the following, let us talk about the different colors of coffee pots that you might want to choose from and use for your outdoor adventures. Blue camping coffee pot: The blue camping coffee pot (or percolator) is ideal for outdoor or indoor use. Depending on the model, it can make up to eight cups of aromatic and tasty coffee. It usually has a steel construction with enamel coating for added durability. Such a blue camping coffee pot can also maximize heat distribution for an even brewing. Blue enamel camping coffee pot: The blue enamel camping coffee pot is another reliable pot for outdoor and coffee lovers. In general, it includes a percolator for smooth and easy operation. It is our friendly companion for the camping site, RV or cabin. You can also depend on it if you’re living in a farmhouse and love old-fashioned and great-tasting coffee. Depending on the size of your group, you must choose the right coffee pot size to ensure that it can brew coffee to the number that can cater to the number of people in your group. For example, there are camping coffee pots that can handle up to six to eight cups while others up to 28 cups. 12 cup camping coffee pot: If you’re camping with the family or with a small group of campers, you might want the 12-cup coffee pot. It is ideal for catering to a medium-sized group of campers. 20 cup camping coffee pot: This coffee pot is for a larger sized group of up to 20 people. With it, you can prepare nice cups of coffee for your fellow campers in the early mornings or for an afternoon treat. Large camping coffee pot: The large camping coffee pot can be for you if you’re looking to enjoy more cups of coffee in your coffee pot even if you’re away and camping. It is also for you if you often go camping with more people. Small camping coffee pot: This small camping coffee pot is for a smaller camping group. It can brew up to six cups of coffee. However, the capacity can be vary from brand to brand or model to model. Extra large camping coffee pot: Depending on the brand and model, the XL camping coffee pot can brew up to 28 cups of coffee. You might want to choose the extra large coffee pot if you commonly camp with a large group of campers. It might also be ideal for you if you want a larger pot ready in case of guests in your camper or RV.